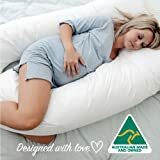 DESIGN: the adjustable C-shaped maternity pillow is ergonomically designed to fit to the natural contours of a pregnant woman’s body to relieve sleeping pains and discomfort. The pillowcase is designed with a zipper for easier cleaning. FUNCTIONS: this maternity body pillow provides belly, arm, and back support for breastfeeding, nursing, watching TV, and reading. MATERIALS & SPECS: high density and extra soft pillow, 100% polyester peach skin fabric, 100% premium polyester filling. Item size - 27" x 56" (77 oz. ), item weight - 5.8 lbs. PACKAGING: partial vacuum packed with an insert in a PVC bag. CARE INSTRUCTIONS: simply take out the pillowcase and wash in a standard washing machine and dryer. The pillowcase is designed to be repeatedly washed. Hang the inner pillow in the sun to regain maximum fluff. I took a chance on this because there weren't any reviews posted when I bought it but after reading reviews on many pillows I bought this one because puredown sells pillows and other bedding and the shape made sense to me. I have bought many pillows over the years (this is my first body pillow) and only a few have ever worked for me. I'm 5'6", not pregnant, narrow shoulders, heavy and use a cpap mask and this pillow does work. I don't know what the stuffing is and I do get a little warm sometimes but not every night so it's probably more me than the pillow. I sleep with one arm and leg under one of the pillow legs and the other arm and leg on top, with my shoulder under the top pillow; very comfortable for me. It's soft but has enough plumpness that my legs are supported and my head is not tilted up. Best part is that, when I turn over I don't have to take the pillow with me. I'm starting to look forward to going to bed again. 5.0 out of 5 starsWish I had purchased sooner! This pillow has made my pregnancy experience so much better! I wish I had not hemmed and hawed over this pillow vs the big baby store versions. This pillow is far superior! I have been using it now nightly for several months and this holding up great! If you are considering this purchase, just go for it. I suffered for about a month of restless pregnancy sleep before ordering and I wish I had ordered the day I felt sore. Great product for a great price and can’t beat the quick shipping (also - it did not have a smell that some packaged items develop, which I was incredibly thankful for). Photo is after months of use and it’s holding up super nicely! 5.0 out of 5 starsThis pillow is a God send! My husband had been wanting a body pillow for years, but was very particular about what kind he wanted. He's a big cuddler but, unfortunately for me, his body temperature runs at approximately 450 degrees Fahrenheit, even in the dead of winter. I love him to death, but the last thing I want on a 90 degree humid summer evening is his body anywhere near mine. I purchased this for him at Christmas and it was the best purchase I've made to date. It doesn't take up more than his half of our queen bed and he can cuddle it on nights when it's just too darn hot. The case is easily removable and washable, but takes a bit of work to get back on, but it's definitely doable. Highly recommend this product for all of us out there whose significant other loves to be big spoon but who's body temperature is similar to the surface of the sun. This pillow is a God send! I bought this pillow for my 5 month pregnant wife as a Christmas gift. While she loves the pillow and it has helped relieve a sore back in the morning and made sleeping a lot easier, I cannot rate it high due to customer service from Puredown. After we received the pillow, we noticed that the zipper seam was not sewn correctly (it appears as though the seam was not caught when it was sewn.) Since she loved the pillow so much, I decided to contact Puredown to see if they could send a replacement cover. After initially contacting the seller, they asked for pictures of the seam. I gladly uploaded the pictures and provided proof of purpose from Amazon. The next day I received a message stating that this was an Amazon issue and to contact Amazon about the quality of the pillow. This is ridiculous, since Amazon did not manufacture this pillow and since it came in a large plastic bag, Amazon could not do quality checks on the item. 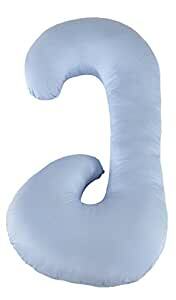 There are several other maternity c-shaped body pillows on Amazon, so you might want to go with one that provides customer service and cares about their customers. The pillow is a lifesaver, but Puredown could use some work. I have attached pictures of the zipper seams. We will keep the pillow and sew the seam ourselves so we don't have to deal with the hassle of returning for a replacement. Gave this as a Christmas present to my daughter in law (due in July). She loves it! My son also loves it! I asked if I should buy him one also - haha - but he said it wasn't necessary because he works shift work, so they trade off. It's getting a lot of use. Anyway, it was a big hit - the best of all the Christmas presents!